Citation Information: J Clin Invest. 2010;120(7):2549-2562. https://doi.org/10.1172/JCI41933. Despite significant advancements in our understanding of cancer development, the molecular mechanisms that underlie the formation of liver cancer remain largely unknown. C/EBPα is a transcription factor that regulates liver quiescence. Phosphorylation of C/EBPα at serine 193 (S193-ph) is upregulated in older mice and is thought to contribute to age-associated liver dysfunction. Because development of liver tumors is associated with increasing age, we investigated the role of S193-ph in the development of liver cancer using knockin mice expressing a phospho-mimetic aspartic acid residue in place of serine at position 193 (S193D) of C/EBPα. The S193D isoform of C/EBPα was able to completely inhibit liver proliferation in vivo after partial hepatectomy. However, treatment of these mice with diethylnitrosamine/phenobarbital (DEN/PB), which induces formation of liver cancer, actually resulted in earlier development of liver tumors. DEN/PB treatment was associated with specific degradation of both the S193-ph and S193D isoforms of C/EBPα through activation of the ubiquitin-proteasome system (UPS). The mechanism of UPS-mediated elimination of C/EBPα during carcinogenesis involved elevated levels of gankyrin, a protein that was found to interact with the S193-ph isoform of C/EBPα and target it for UPS-mediated degradation. 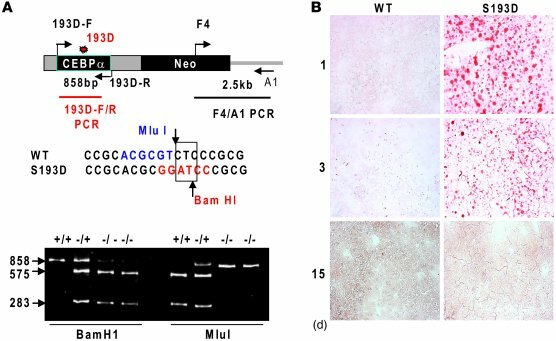 This study identifies a molecular mechanism that supports the development of liver cancer in older mice and potential therapeutic targets for the prevention of liver cancer. Generation of C/EBPα-S193D mice and characterization of liver functions in these animals. (A) Genotyping of C/EBPα-S193D mice. Upper image shows a structure of the targeting construct and positions of primers used for genotyping. Primers 193D-F and 193D-R were used for generation of PCR products and following restriction with MluI and BamHI. Middle image shows the sequence surrounding S193. TC nucleotides were mutated to GA, leading to the disruption of the restriction site for MluI and creation of restriction site for BamHI. Bottom image shows an example of genotyping. PCR products of 858 bp were generated using DNA from littermates and examined by restriction with MluI and BamHI. (B) Oil red O staining of the liver of WT and C/EBPα-S193D mice at days 1, 3, and 15 after birth. Original magnification, ×20.